In a tribute to the centenary of Henri Dutilleux’s birth, Music Director Ludovic Morlot and the orchestra released a commemorative box set of the composer’s major orchestral works. The last time Ludovic Morlot saw Henri Dutilleux, the composer was waving to him from the window of his second floor apartment in the heart of Paris. Their friendship began more than a decade earlier when Morlot was a conducting assistant for Seiji Ozawa at the Boston Symphony Orchestra. At that time, Dutilleux was making changes to the score of The Shadows of Time, which had been premiered in Boston a few years earlier. Morlot worked with him and the orchestra to perfect the score. Morlot made good on his promise, visiting Dutilleux each time he returned to Paris. “I would call him and say, ‘would you have a little time to see me?’ He would always say, ‘oh I’m tired, so why don’t you just come for a few minutes.’ And then a few hours later we were having wonderful conversations,” said Morlot. The two friends would talk about music, literature and the visual arts. 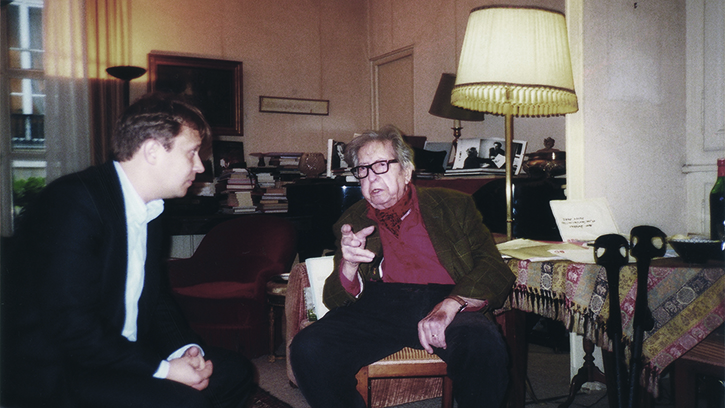 Dutilleux also gave Morlot insight into his compositions and into the world of Paris in the ‘30s, ‘40s and ‘50s. When Morlot joined the Seattle Symphony in 2011 as Music Director, he was eager to embark on a survey of Dutilleux’s major orchestral works. His very first subscription concert with the orchestra featured Dutilluex’s violin concerto, L’arbre des songes (“The Tree of Dreams”). At that time, Dutilleux was an unfamiliar composer to Seattle audiences. Programming his music was a bold change and ultimately “a stroke of genius,” says Simon Woods, President & CEO of the Seattle Symphony. That work has begun to pay off in accolades from critics and audiences alike, including a 2015 Grammy for the recording of L’arbre des songes with violinist Augustin Hadelich on the second volume and nominations for Best Orchestral Performance and Best Engineered Album. The first volume, released in 2014, received three Grammy nominations for Best Orchestral Performance, Best Classical Instrumental Solo by cellist Xavier Phillips and Best Engineered Album. Five years after beginning a journey together, Morlot and the orchestra released the complete three-disc survey of Dutilleux’s major orchestral works in August 2016 on the Seattle Symphony’s in-house record label, Seattle Symphony Media, alongside the release of the third volume of recording project. Listen now to the complete, three-disc collection of Henri Dutilleux’s major orchestral works through your preferred online music retailer or streaming service.